A senior traveling abroad is often looking for one last shot at freedom and adventure before settling down to build a career. Those elements likely factored in to Michelle Pedicone’s decision to go to Nicaragua, but traveling as a member of the Drexel chapter of Global Brigades, her trip would entail much more sweat and hard labor than the typical spring getaway. Global Brigades, a campus-based international nonprofit, focuses on medical and economic development in under-resourced communities using a holistic approach. 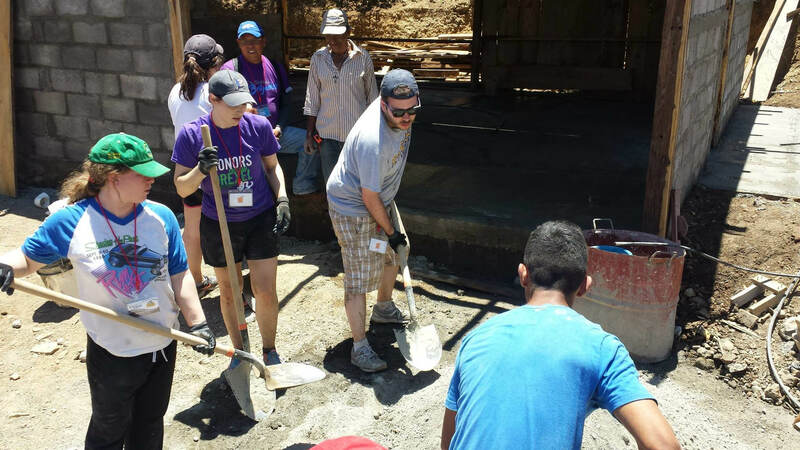 Michelle’s training to become a “brigader” focused on Nicaraguan culture and the task ahead – constructing sanitation stations and concrete floors in a rural village. She says a big part of adopting the holistic model was learning not to “think of myself as a savior” but as someone who was going to partner, teach and also learn. After undergoing weekly training throughout the winter, Michelle signed up for the public-health-focused March brigade to Nicaragua. She arrived, after a combined six and a half hour flight and two additional hours on a bus, at the Global Brigades compound outside the small village of La Naranja, Nicaragua. There, she joined students from Drexel and several other schools in assisting local masons as they built sanitation stations with private toilets, septic systems and running water. On days off from building the stations, Michelle and her fellow brigaders taught “charla,” or educational chats. They spoke with children about education and exercise, and taught villagers how to use and care for their new sanitation stations. During a break from hard labor and charla, Michelle joined eight other Drexel students for a hike up the 1,200 steps carved into the slopes of El Llano Del Cruz. From the peak, the brigaders could see the entire valley and town below, providing a valuable perspective on the work they had just completed. After returning to Philadelphia, Michelle focused on completing her accounting degree and studying for the CPA exam. As president of Beta Alpha Psi and member of Gamma Sigma Sigma, a community service sorority, her focus on helping others has remained consistent. While she hopes to return to Nicaragua someday, the trip will have to wait while she pursues her career in accounting. Following graduation, Michelle plans to join EisnerAmper as a tax accountant. Three Drexel LeBow professors embody the tradition, the challenges and the potential of the West Philadelphia neighborhoods that Drexel President John A. Fry is looking to transform.